For the last few years, the web design world has gone through some drastic changes. One of which is known as responsive design. It’s the idea that when a website is designed, the developer should build the site to fulfill the scope of multiple screen resolutions such as the iPhone, iPad, and all of those in between. About 4-5 years ago, developers would approach this as a second thought. The idea was new and the iPhone just came out with a web browser that actually displayed the web like its desktop counter part. Therefore, why think about it? The iPhone displayed the page in its entirely. No loss, just requires to use of pinch to zoom to read it. Before then, those with mobile Internet devices such as blackberry and windows mobile, would strip out most of the site design, almost taking us back to the 90’s. Apple’s mobile Safari was a game changer. It used the same driving engine from WebKit and processed the exact same website in your hands that you would have seen on your desktop computer. However with this great technology, users quickly found that reading on a small device was becoming trivial. Sure you could pinch to zoom and scroll around, but it wasn’t the same. Sometimes you would need to zoom, pan the screen left, move to the right, then pan back left to read the next line. Trivial. The great minds then decided to create dedicated mobile versions of their website. This version would serve all the mobile devices on a separate domain, usually m.domain.com or mobile.domain.com. These worked well for what it was but soon after they too started to become a problem. Sometimes the mobile version would be incomplete, missing individual pages, or missing content. In addition, the developers had to manage two or more completely different sites, the main and the mobile. This cost time and resources, not too mention confusion as one article may not be on both sites. Then we came to the view of being responsive. The idea was to make the the same exact website, with everything displayed, respond to a different browser size automatically. This became the perfect answer (so far). Serve the same webpage to all browsers including mobile and tablet devices, then just rearrange the content to fit the screen size. The developer would only need to make a single update and the change is served to everyone. Then all browser windows with a width meeting or smaller than 480px’s across will show the body font size at 0.8em instead of the typical 1em, or base font size, that might be used for the desktop version. This gave way to allowing developers to easily target and deliver custom styles based on the device’s screen size, regardless of what the device brand was. By planning your website project for mobile devices at the beginning, the developer or designer would be able to adjust early on and format their content to meet all of the mobile possibilities including the desktop. Knowing and planning to use responsive styles to build your design, the developer or designer would be incorporating max-widths, percentages, EM’s, in addition the @media queries to build the site. Plan now and save time for the future. Let’s take the following example. 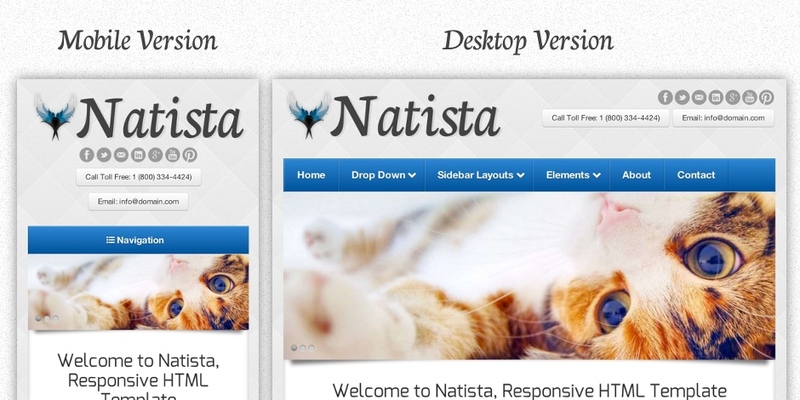 It’s from Natista, one of our HTML templates that we sell in our online store. It’s responsive and was built with the idea of working on all devices regardless of size. Let’s take a look at one of the design elements, the main menu. We knew that we wanted a menu that would respond to all views and still look and act like a menu. We designed our menu to look the same, visually, even though it responds differently. We also clearly labeled our mobile menu to let the viewer know that this is a menu and you can click/touch it. Another aspect of the above example, is the image slider (the cat that makes you go aww). The slider is from the well known Flexslider jquery plugin and automatically responds to the browser window size. In fact, the entire design of Natista does exactly this. All images use a max-width:100% css property and site layout uses a fluid grid system of percentages. Planning with these ideas will allow the entire site to flow to any viewer and any device. 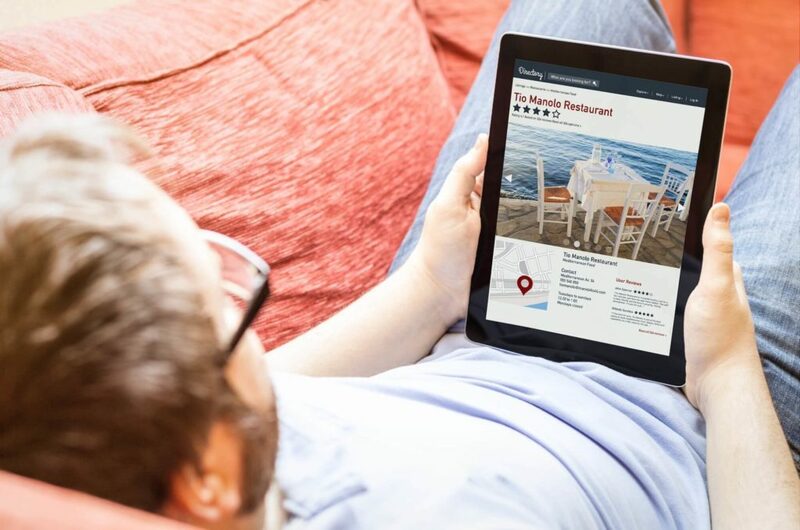 Given the rapid adoption of tablets and smartphones in the consumer market place and the fact that users seem to prefer reading their news, blogs, and favorite sites on the mobile web, I think it’s inevitable that 2013 will be the year that responsive design takes off. In fact look at all of the HTML and WordPress marketplaces, most if not all, of the templates for sale are responsive. Owners want it, developers want to build it, viewers want to use it! By now, all of the latest major browsers support Media Queries, CSS3 and HTML5. However, IE8 and older will need a little help from the html5shim or another equivalent plugin/script. So take the plunge, build quality responsive websites. So how does one apply the same philosophy to newsletters? Most of the newsletters I receive look horrible on my smartphone. Unfortunately with email, we still have to use tables, inline CSS, and no divs to build our structure. So this makes it a little more difficult. This is because of Yahoo, Hotmail, Outlook and even Gmail will still strip out the CSS. However, there is always hope. Here’s a quick guide, I just did a search for that may help you. Basically you can apply the same idea using @media queries. Therefore, devices such as the iPhone, which doesn’t strip out CSS, will use them. With that said, to help with mobile and even the email providers listed above, you want to keep your email table maxed at about 600px’s wide. This allows it to more easily be seen on a mobile phone. Here is an example of one that I’ve done recently. It’s not “responsive” but does display properly in all of the email clients using tables.